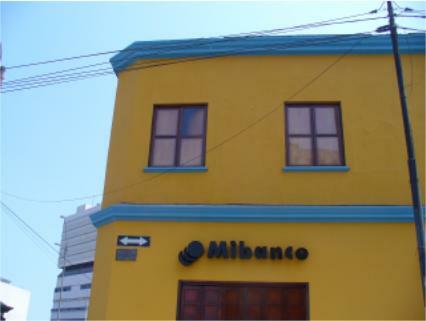 At the corner of Ave. Garcilazo de la Vega and Ave. Espana there sits a relatively nondescript building which is, nonetheless, believed to be one of Lima's most haunted buildings. Painted yellow, with blue trim, and four-pane windows it looks far cheerier today than it did when I was a child. Back then, in the 1970s, the upper story was unpainted and its windows empty of glass and, through them, it was evident that the upper story itself was empty, uninhabited and unused. It is, after all, the second story that is said to be the locus of the haunting. Then, and until not that long ago, the ground floor of the building was occupied by a commercial house specializing in home appliances and other electronics, owned by the Matusita family, for whom both the store and the building were named Casa Matusita. Various stories surround the house and the origins of the haunting. One is that the building was once home to a man who abused his servants cruelly. In revenge they laced the food at a dinner party hosted by the man with a drug and locked them in the dining room. When they checked on the man and his guests the next morning they supposedly found that, subject to the hallucinogen's effects, they had brutally killed one another. Another story is that a man went mad there, and killed his wife and family before committing suicide. And, yet a third and similar one, is that the original Mr. Matusita, founder of the business, found his wife was cheating on him and killed her. He is said, to have then hung himself in grief over that act. One of the first victims of the haunting was said to be a priest who entered to attempt to put the souls to rest, and died, perhaps of heart attack, in his desperation to leave the place. The haunting story gained traction in the 1960s when an Argentine radio and TV personality, Humberto Vilchez Vera, was said to have announced that he would spend the night in the upper story. He was said to have emerged out of his wits, babbling incoherently and frothing from the mouth. In fact, I remember being told that very story by my mom, as the bus we were taking home from downtown passed by the Casa Matusita. Years later and by then back in Argentina, Vilchez wrote that, despite the fact that many people insist that he did, he never spent the night there, and that even though people insist that they saw him go in, he in fact never even entered the place. He said that he was in a hospital about that time, but it was from nervous exhaustion, not ghost-induced hysteria, and that he was interned before he was supposed to go into the Matusita house. Apparently, however, at the time of the supposed events, and since, few believed his explanation. Whatever the origins, and whether haunted or not, the fact is that in many decades no one has occupied, and barely even touched, the second story of that otherwise sound and valuable property. Thanks for telling what you know about Casa Matusita - I'd only heard little bits and pieces up to now.